software, content oa web page, or even a late night drawing on a cocktail napkin. Our designers can make it work. Take your team, club, or shop to the next level with custom socks from SOS – we’ll help you design the sock you envision in the material of your choice with all the right features for all of the activities that you are doing. Only 72 pair minimum for standard cuff heights and 60 pair minimum for knee highs. 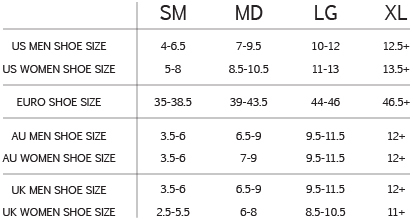 We offer four sizes, small, medium, large, and extra large, (see below for size chart.) You may choose any or all sizes, and minimum per size ordered is 12 pairs. Click here for full description of features. *Features add an additional cost. Click here to view the custom gallery. CALL OR EMAIL TODAY TO TALK CUSTOM SOCKS!